You know what good looks like, and we’re here to help you find it. Debut enables you to identify and attract only the most relevant, diverse and engaged candidates. Define and attract your ideal candidates using our detailed targeting metrics. Reach out in seconds with real-time responses from candidates. Improve every single interaction with candidates and instantly boost your employer brand. Execute targeted attraction campaigns and find your ideal candidates in a matter of minutes. Reach relevant, engaged and diverse candidates at any university in the UK with a single campaign. Activate passive candidates that never would have come across your opportunity organically. 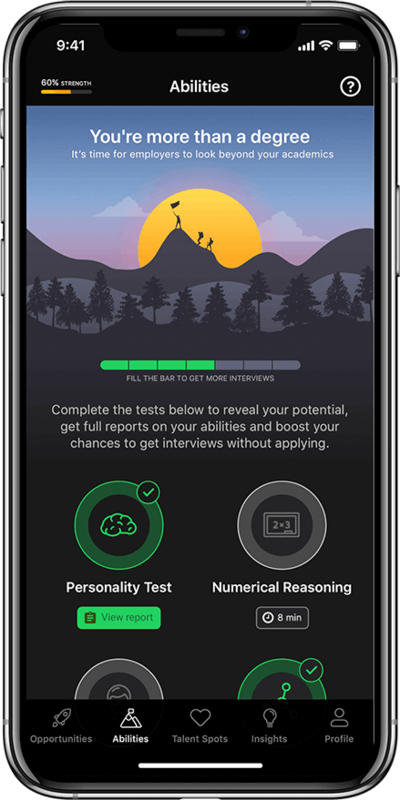 We know what makes candidates unique so you can identify the best talent for your business with psychometric and behavioural targeting. We enable you to connect instantly with today’s digitally native students and graduates through our mobile and digital engagement platform. We help early talent get their career off to a flying start by navigating them through the emotional and practical journey of finding their first job. Debut is great for giving us access to an active student market we couldn’t reach in a mobile-centric way before. EY has already seen more than a 50% reduction in the cost of acquisition of hired candidates that have come through Debut, compared to other traditional recruitment and attraction methods. As a technology company, partnering with the Debut’s mobile jobs app seemed fitting. Debut has since provided us with an easy and efficient way to target 1000’s of students. Through the use of Talent Spots the platform has enabled us to reach out to a very specific market, making the recruitment process more streamlined for both ourselves and the students.